Riverfest has been the official kick off of summer in St. Charles for more than 30 years. Come and join the fun! Enjoy events on the water, in the sand and up on stage. The weekend is packed with plenty of family-friendly activities. For more information, including a full schedule of events, visit prideofthefox.com. The City of St. Charles recently received the Star Award from the Preservation Partners of the Fox Valley for preserving the historic Jones Law Office and moving it to its new home in Camp Kane in Langum Park. The building once belonged to Steven Sandborn Jones, a lawyer who moved to St. Charles in 1838 from Vermont. He is credited with proposing the town change its name from its original Charleston to St. Charles after he learned another Illinois town already had the Charleston name. During the Civil War, the small law office building served as a holding cell for deserting soldiers. Evidence of the soldiers’ presence is still apparent in the graffiti they left behind. Fourth Ward Alderman Jo Krieger worked with the Camp Kane Foundation to make sure the building was preserved when the property it previously stood on was sold. “It was important to save the building because it is a major part of the history of St. Charles, with Jones being one of our founders, and of Kane County,” Krieger said. Alderman Krieger has a keen interest in history, especially Civil War History. Two of her great, great uncles fought side-by-side in the Civil War—and survived. Do you receive the city’s eNews? Brush (branches at least three feet long and less than 12 inches in diameter) must be placed on the parkway, in front of your house (or along the frontage where refuse/recycling is collected), cut ends facing the street before 7am on Monday of the scheduled pick up (or Tuesday if Monday is a holiday). Please note: Pick up in your area may take three to four days to complete. Do not bundle brush. Piles should not be higher than four feet and never placed in the street. Also, crews can’t pick up the brush if a vehicle is parked in front of the pile. For more information visit the city’s website at stcharlesil.gov/services/brush or contact the Public Works Department at pw@stcharlesil.gov or 630-377-4405. The St. Charles America in Bloom Committee is digging right in to prepare the community for the 2015 America in Bloom national awards program. 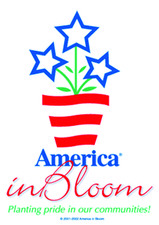 America in Bloom promotes nationwide beautification through education and community involvement by encouraging the use of flowers, plants and trees, and making other environmental and lifestyle enhancements. From July 12–14, two program judges will be in St. Charles touring floral displays and landscaped areas. They also will be reviewing heritage preservation, urban forestry and environmental efforts, in addition to the overall community impression. Pink, purple, white and yellow have been chosen as the colors for the program’s plantings. Consider these colors as you plant your spring flowers and be a part of the effort! Volunteers are always welcome. For more information, contact Steve Amatangelo at steve.amatangelo@sartorius-intec.com or 630-338-7085; Diane Cullen at dianecullen@sbcglobal.net or 630-377-3555; or Maureen Lewis at mlewis@stcharlesil.gov or 630-584-4622. How does the city prepare for summer storms? With the warmer temperatures, comes the chance of summer storms, which sometimes can be severe. But the city is ready. The Emergency Management Agency monitors the weather constantly to make sure we issue the necessary information and warnings regarding upcoming storms. The Public Works staff also jumps into action and makes preparations as well. The primary cause of power outages during storms are tree limbs that break and fall into the power lines. The city has an active tree trimming program but some trees grow faster than expected. Please report any tree limbs that hang over or are growing up into the power lines directly to the Electric Office at 630-377-4407. For more information, contact the Public Works Department at pw@stcharlesil.gov or 630-377-4405. The St. Charles Electric Utility proactively maintains the city’s streetlights. However, they also rely on residents to notify them when streetlights are out, flickering, or have other maintenance issues. If you notice a streetlight (not traffic signal) is malfunctioning, submit a service request either through the St. Charles Connect mobile app or with the online service form, or call the electric utility at 630-377-4407. Include your name and phone number so they may contact you if additional information is needed. Have fun all day. Picnic, swim, mini-golf. Then enjoy music ‘until dark, which sets the stage for a magnificent fireworks display. Get the best view from Pottawatomie Park or Ferson Creek Park. More at stcparks.org. 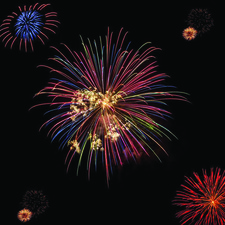 City of St. Charles offices will be closed Fri., July 3 for the Independence Day holiday weekend.